The Silentaire Val-Air 150-50 AL is a noiseless compressor offering hours of air pressure supply to professional air brush art projects. Expert air brush project demand a high caliber compressor. 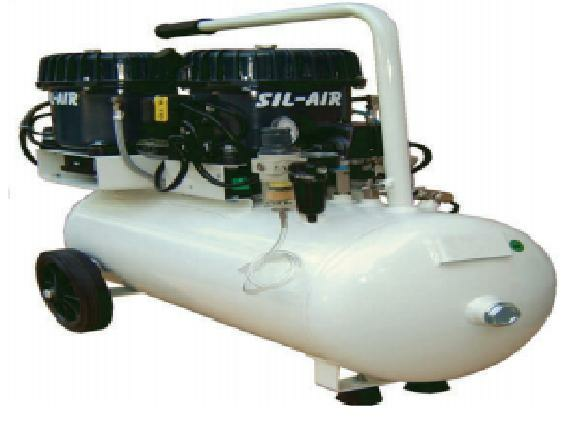 Silentaire Val-Air 150-50 AL is a compressor designed to deliver continuous air pressure without maintenance. The virtually silent Val-Air 150-50 AL allows an artist to work without sustaining the hazards of environmental noise. The top choice for optimal air brush paint application, the Val-Air 150-50 AL outperforms similar competitor models. The Silentaire Val-Air 150-50 AL comes equipped with air tank, tank pressure gauge, line pressure gauge, safety valve, pressure regulator, built-in moisture trap, air intake filter and convenient carry handle and wheels for maximum portability. The compressor outfitted with a heavy-duty .5 horsepower "AL" pump, featuring an aluminum head with auto cooling fins, and in-line coalescing filter for oil removal. Available in 220volt/60Hz or 220volt/50Hz voltage units.